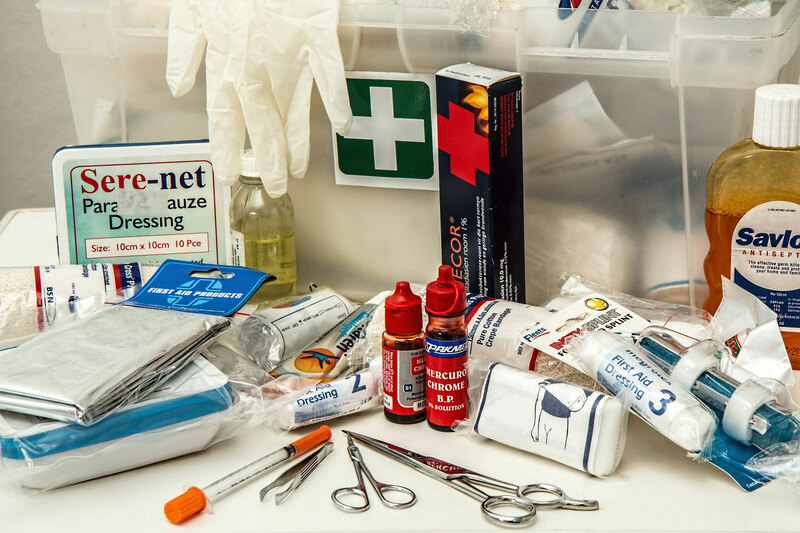 First Aid Kit that is used during emergency situations. 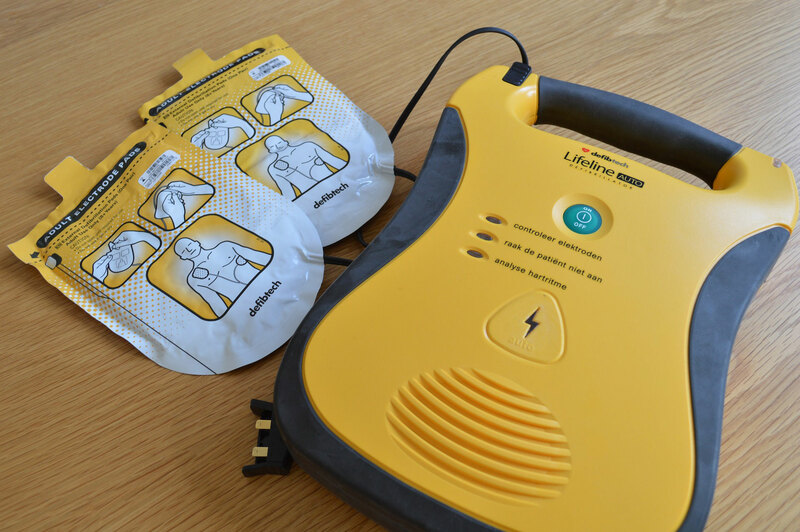 Automated external defibrillator is a device that automatically analyzes the heart rhythm and may deliver a shock to restore a normal heart rhythm. 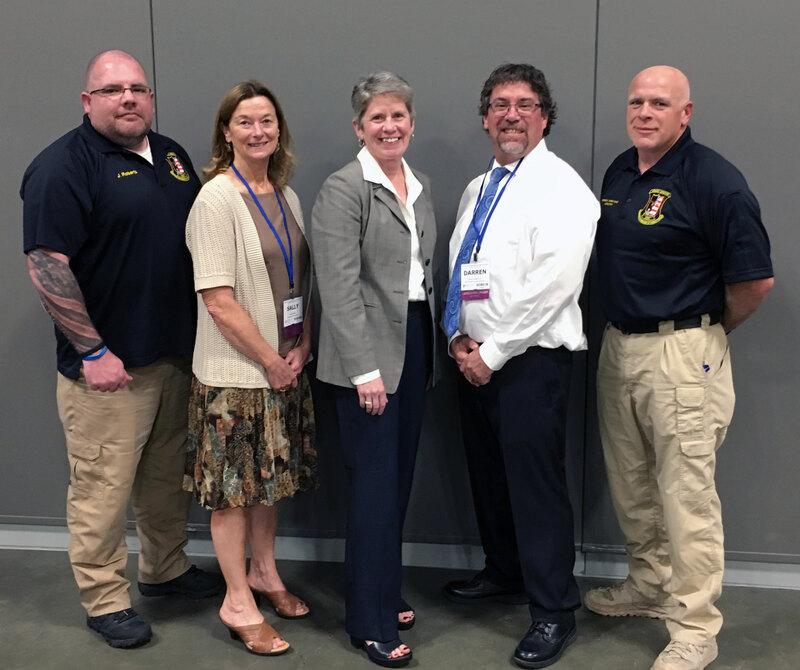 SPOKANE – Four Department of Corrections (DOC) employees received Governor’s Lifesaving Awards on September 27, 2018 during a luncheon at the Governor’s Industrial Safety and Health Conference hosted at the Spokane Convention Center. 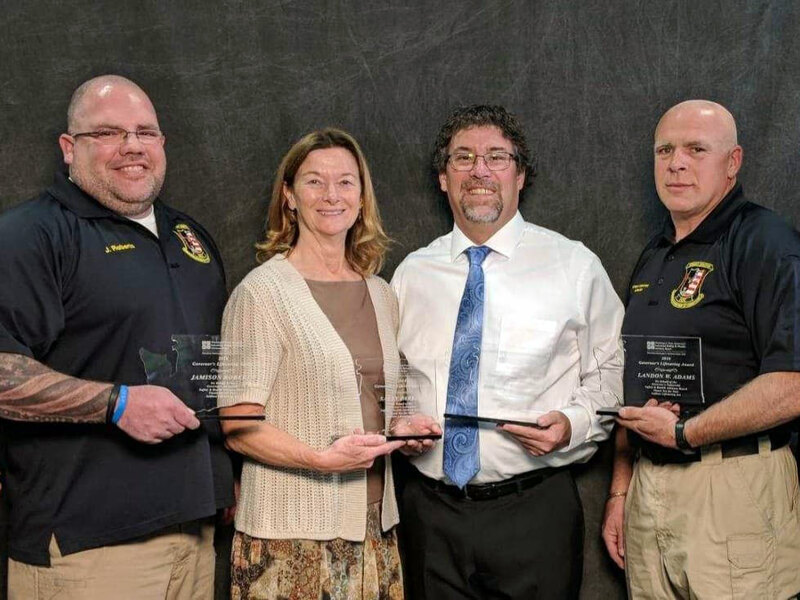 The recipients are Washington State Penitentiary Correctional Unit Supervisor Landon Adams, Washington Corrections Center for Women Correctional Officer Darren Gooding, Information Technology Specialist Sally Parker, and Emergency Management Program Specialist Jamison Roberts. Parker and Roberts both work at the agency’s headquarters in Tumwater. 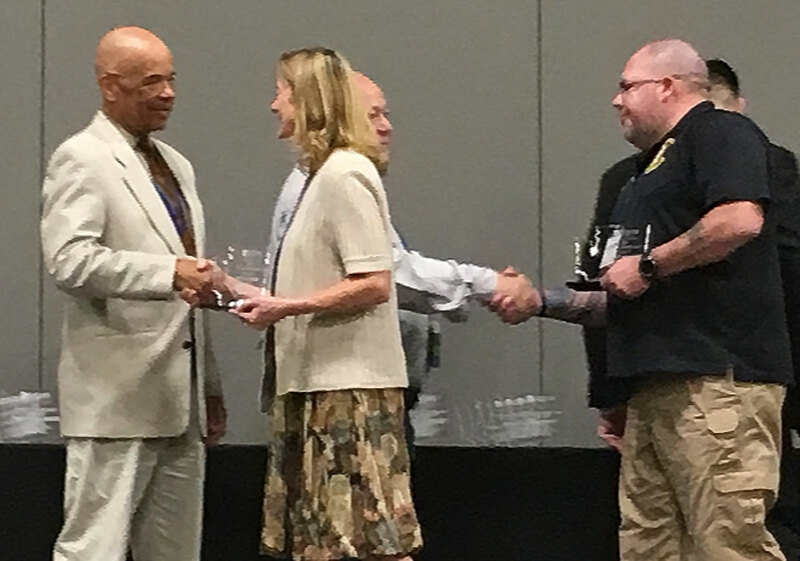 Adams and Gooding received their awards for saving the life of a correctional officer during an emergency response team academy training exercise on McNeil Island in August 2017. Though the McNeil Island Corrections Center closed in 2009, DOC and military personnel still use the grounds to hold training exercises. Adams and Gooding, who are co-facilitators of the academy, were leading a physical fitness run. Gooding noticed one of the runners begin to struggle. He stopped and pulled the man, a correctional officer from Clallam Bay Corrections Center, out of the formation. As Gooding began talking to the runner, he noticed the runner was having difficulty breathing. Gooding helped the runner onto the ground into a recovery position. Gooding called Adams over to assist and had one of the other instructors call 9-1-1. Moments later, the runner stopped breathing and lost consciousness. Neither Adams nor Gooding could find the man’s pulse. Adams immediately began chest compressions. After about four sets of chest compressions, the man suddenly took a breath and slowly began regaining consciousness. Paramedics took the man to the nearest hospital on the mainland. The man made a full recovery and has since returned to work. All DOC employees receive first aid and basic emergency response training and that’s what made the outcome a success, Adams said. Adams’ corrections career spans 24 years. He began as a corrections officer at the penitentiary in 1994 and has held positions including sergeant, correctional specialist, academy supervisor, and correctional unit supervisor. Gooding has worked for DOC for more than 25 years. He was hired as a correctional officer at Clallam Bay Corrections Center in October 1992. He’s worked at Washington Corrections Center for Women since 1993. Parker and Roberts received their awards for coming to the aid of a coworker who suffered a heart attack in December 2017. Parker was working at her cubicle when she heard some commotion and a voice ask if anyone had called 9-1-1. Without hesitation, she ran over to where the noise was coming from and instructed a coworker to make the emergency call. She then informed security that an ambulance was on its way so they could guide the medics when they arrived. Parker then called the building’s emergency line. By then, the coworker who was having a heart attack lay unconscious on the floor, so Parker began doing chest compressions. Parker had taken CPR classes many times over the years, but she never had to use it before that day. “My training kicked in and I knew exactly what to do,” Parker said. Meanwhile, Roberts, who works in the department’s emergency management division, was notified of the situation. He grabbed one of the building’s automated external defibrillator devices from the wall and brought it to Parker and the unconscious worker. Parker and Roberts applied a shock using the defibrillator and continued CPR until emergency responders arrived to bring the worker to the hospital. The worker has since made a full recovery and returned to work, Parker said. Roberts added a large part of his job involves educating and training staff about planning for emergencies in their day-to-day lives, and he was glad fellow staff could use what they learned and put it into action. Parker has 27 years of state service, 19 of which have been with DOC. Parker was a counselor at the women’s prison for six years, and served as a community corrections officer from 1981 to 1985. From 2002 to 2008, Parker worked within the department as a finance specialist before taking a job as an information technology specialist. Roberts stared working at DOC in 2002 as a correctional officer. Since 2015, Roberts has worked in the department’s emergency management unit as an emergency management program specialist. Nominees must have performed the lifesaving act during work hours. Recipients are receiving awards for incidents occurring between June 1, 2017 and May 31, 2018. Nominees must have performed “hands-on” aid. For law enforcement officers, firefighters, emergency medical technicians and similar professions, the lifesaving action must be considered above and beyond the normal call of duty. The Governor’s Industrial Safety Health Board gives out the awards each year. For more information about the awards, visit here.